The last 2 pies I made (sicilian with starter) the dough has stuck to the bottom of the pizza pan during the parbaking. I've followed the recipe in the book (except for the 2nd pizza stone) and don't know why it sticks. The first one I made came out perfect (sicilain without starter) The pans were well oiled during the parbaking. Vito: I had the same experience. You might try a non-stick pan. The dough inevitably soaks ups the oil. Thanks Maria. I did some research and just ordered a steel non stick Sicilian pan. I’m sure this is going to help. It was quite expensive coming in at $80 from allied but all the reviews have said this is “the” pan to get. The Allied pan you ordered is expensive, but absolutely worth it. This is what I used for my Sicilians and I've never had a problem with it sticking. What kind of pan are you currently using? My guess is it might not been seasoned. I just started making pizza when I received The Pizza Bible book this past Christmas. 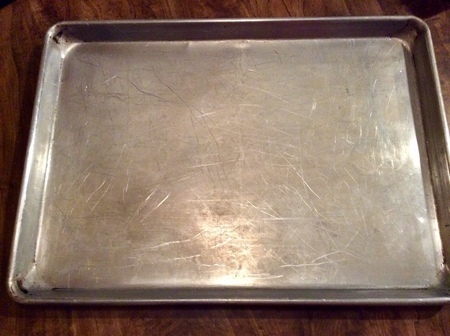 I was using 12x18 aluminum baking trays and am looking forward to the Allied pans.